I write on a very muggy day in central Illinois. It’s a day made for thinking about bad air, toxic humors, fuzzy minds, and muddled actions. The concerns around the unhiring of Steven Salaita have preoccupied me for a month. I will not go over ground so ably covered elsewhere, but I need to sort out the tangle of issues that have accompanied the polarizing non-discussions occurring on this campus. If I could separate some of the tangle into various, named threads, maybe I could begin to find ways to talk to others. Here goes. How is a large research university governed? In reality? Aspirationally? Is there shared governance with faculty? What percentage of the faculty care about sharing governance? Does the governor have a say in the academic programs? Do and should the University trustees on the governor-appointed board have a say in the academic programs? There are statutes that govern these areas—are they being ignored, distorted, or followed? Does the incumbent Quinn’s contested race have anything to do with the current crisis at the University of Illinois? Is Quinn trying to prove anything? And to whom? 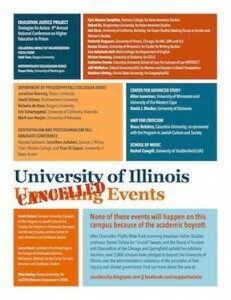 So, Carle Foundation and the UIUC campus administrators are pushing hard for this. There’s money to be made by some folks, though not the schools, parks, and citizens of Urbana, who continue to get heavily taxed while Carle runs its “not-for-profit” healthcare empire. What does this have to do with the current administration’s behavior? Is the College of Medicine agenda—and its corporate funding—trumping other agendas? There’s the apparently pro-chancellor Faculty Senate, the divided committees, the pro-union, mostly anti-chancellor Campus Faculty Association, the north/engineering campus, the liberal arts college, the well-funded ag college, and the departments that have voted “no confidence” in the chancellor and the Board of Trustees. The artists and humanists feel and mostly are trivialized and underfunded. How do we get out of this impasse? Would anyone but the artists and humanists notice if the arts and humanities disappeared? “Academic freedom” is a phrase that gets batted around on all sides. The American Association of University Professors has defined it, and the UI supposedly endorses this. Of course, abstractions are pretty easy to support; it is when we have to embody and speak the details that things get rough. What would our campus be like if it truly centered the goals and ideas of the American Indian Studies program and other “ethnic” and gender studies programs? What does inclusion mean here? What reparations do we need to implement to address centuries of racism and violence on this land? I haven’t even discussed Steven Salaita; it’s hard to fathom where to start. I have left out so many other aspects too, but naming and questioning contributes to the necessarily ongoing process of facing and challenging the swamp that is Illinois.